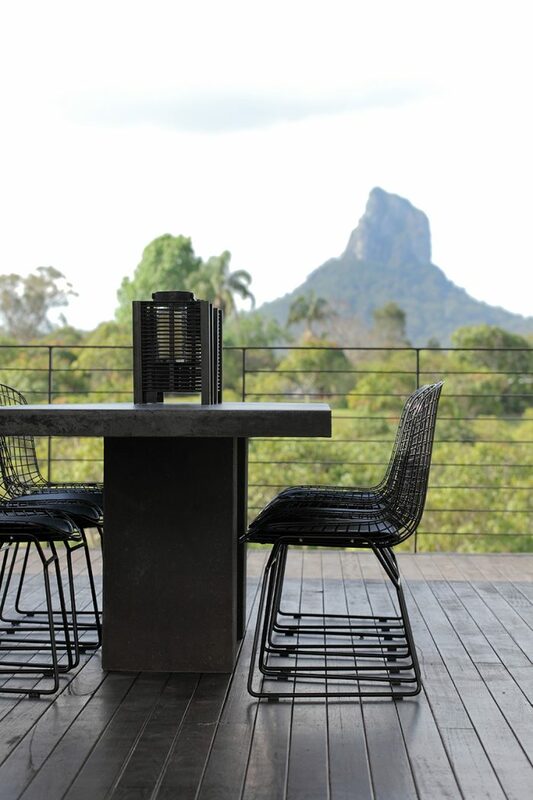 How would you feel if you owned a 20 acre slice of luxuriant Sunshine Coast hinterland with magnificent views of two imposing mountains, and your guests could enjoy all that splendour while you lived in an old farmhouse without views? 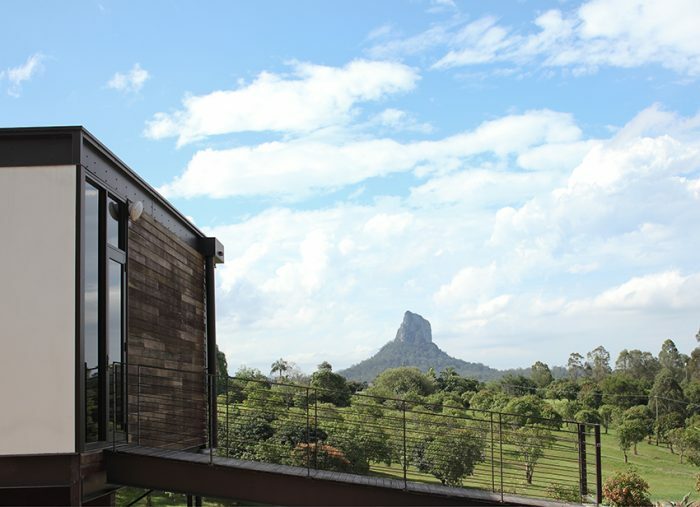 This was the case for Bill and Misao Rogers when they bought a 20 acre mango farm near Maleny with a goal to create a tranquil B&B of three luxurious cottages looking onto the Glasshouse Mountains. Once the cottages were built, and guests came to enjoy the countryside in the absolute luxury of the cottages, Bill and Misao’s cramped farmhouse became a sore point. “It was pretty basic and had small windows, all pointing the wrong way,” Bill said. “We lived in it while our guests enjoyed their modern stylish ‘pods’ but we thought “we shouldn’t be living like this”, so we decided to build ourselves a nice house nearby but away from the cottages.” The Rogers had commissioned Maleny architect Norm Richards to design the cottages and admired his contemporary style so much that it was only natural he be called back to design their own home. 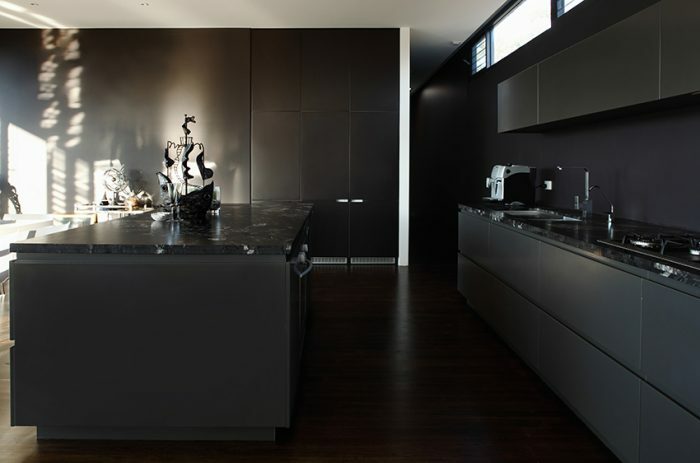 The gourmet kitchen is a space of understated detail, clean surfaces and sleek lines. 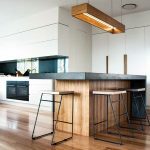 A granite topped island bench allows effortless movement from kitchen to dining to living areas. 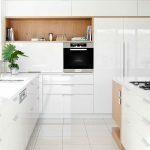 Diesel two-pack cabinets conceal integrated fridges and appliances. 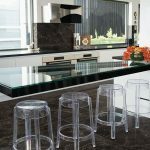 Wire polished titanium granite adds depth and texture. 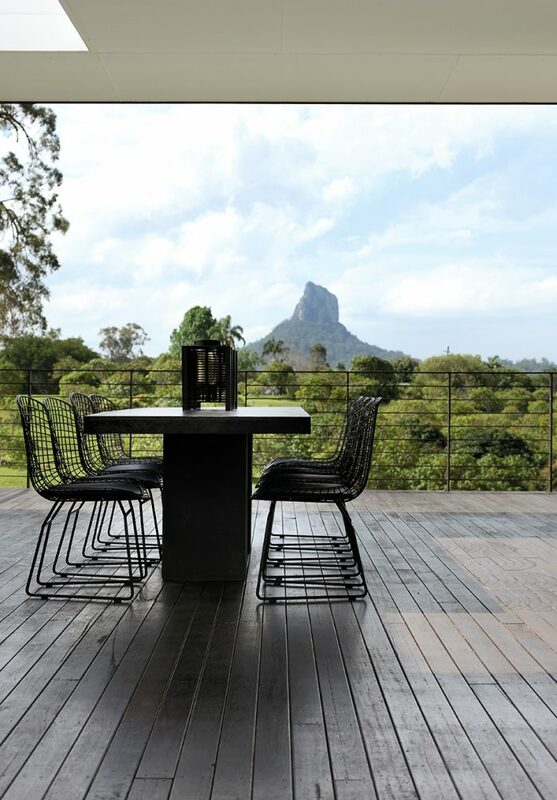 Interior colours were inspired by the subtly changing hues of the Glasshouse Mountains. 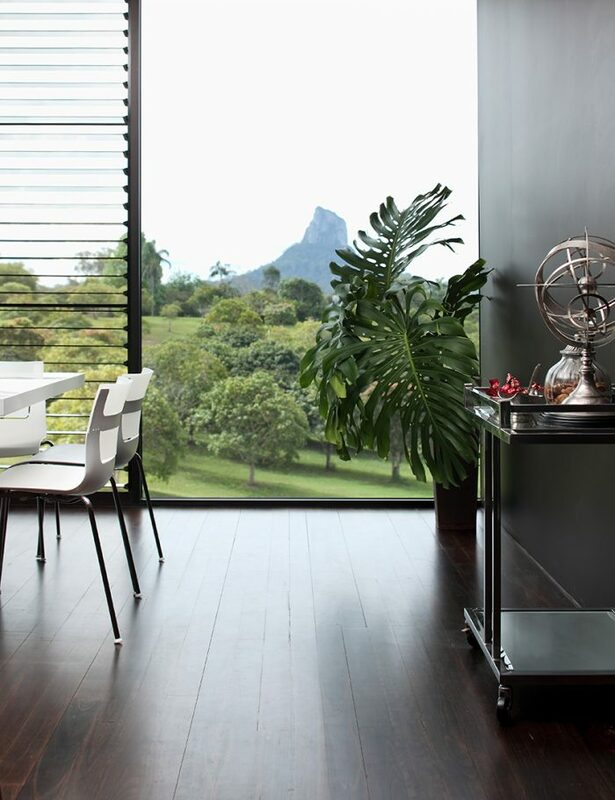 Three variations of black – Resene Diesel, Foundry and Barbeque – create a moody contrast to the wall of glass and help anchor the rooms, while simple materials of dark stained wood, stone and grey tinted glass were chosen so as not to compete with the stunning view. 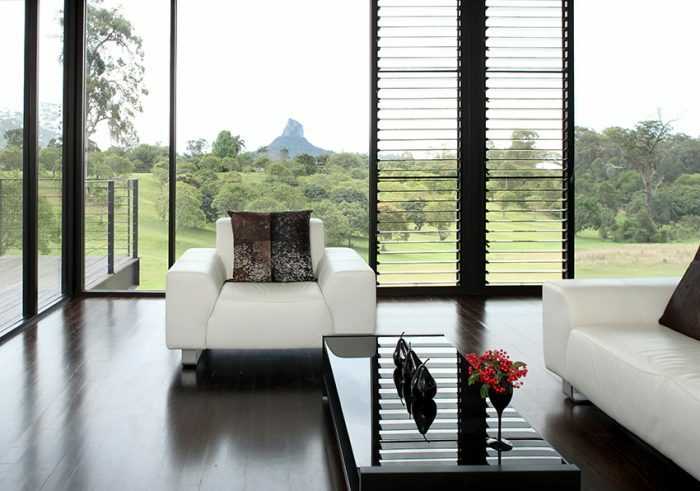 Every room has natural cross ventilation with high clerestory louvres which ensure privacy while floor-to-ceiling louvres and fixed windows face Mt Coonowrin and Mt Beerwah. 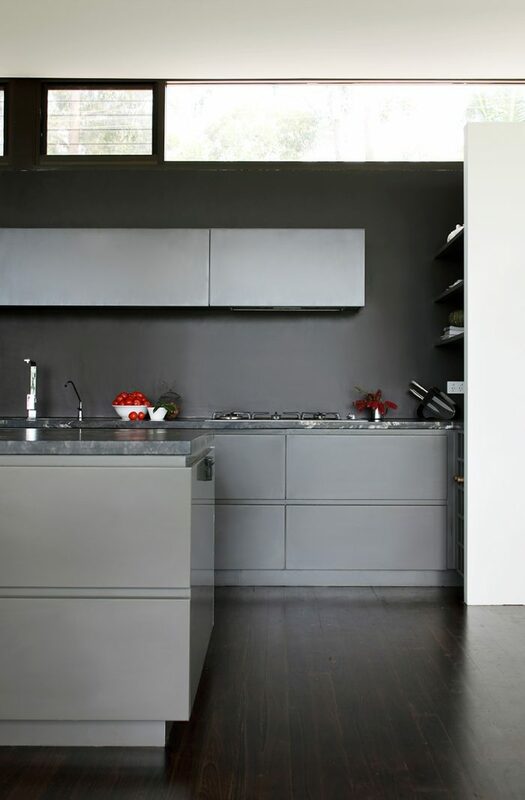 Overhangs to the north, high performance grey-tinted low-e glass and bulk insulation provide natural solar passive thermal performance so the house heats and cools itself. 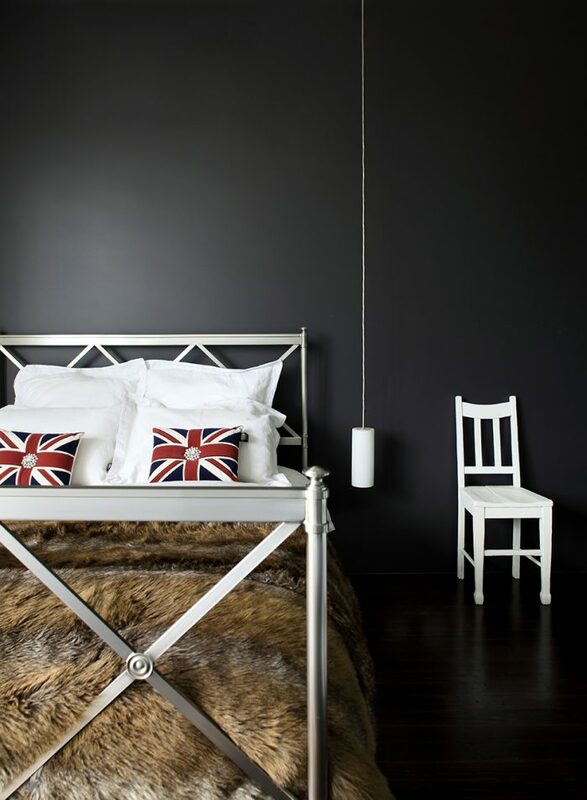 In the main bedroom an iron claw foot bath sits over a bed of white river pebbles set against a wall of structured black tiles. 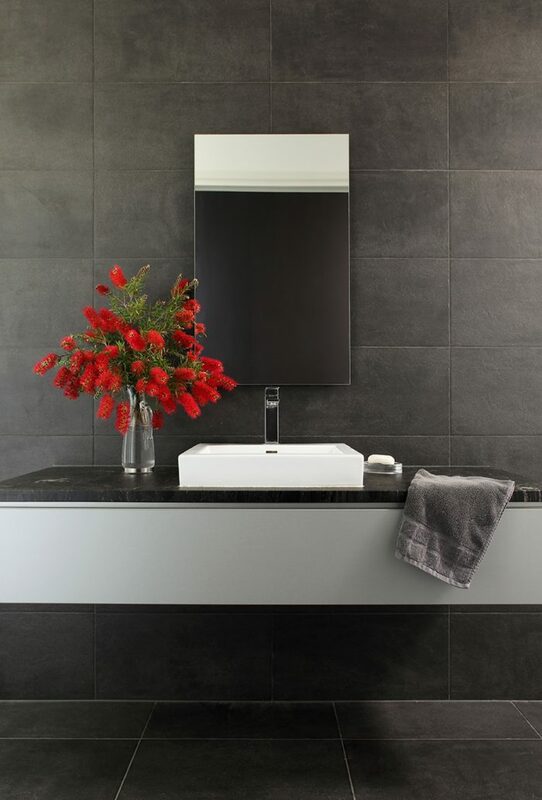 A vanity top of heavily textured river-washed titanium granite invites the touch. 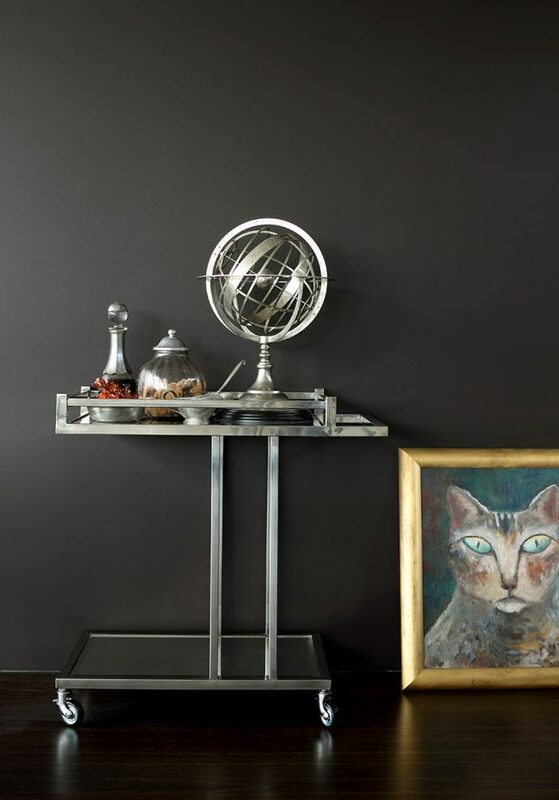 Furniture and object d’art have been kept to a minimum to avoid taking the eye away from the outside glory. “It’s not minimalist,” Bill said. 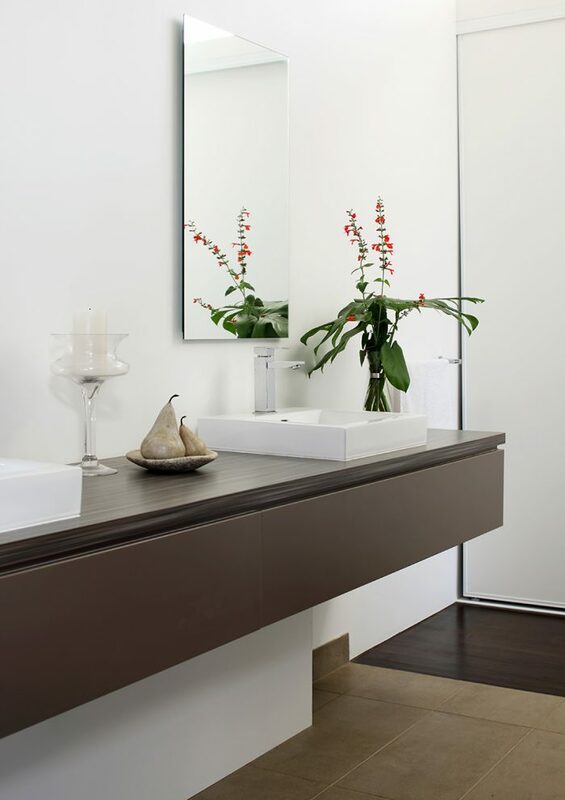 “The architect designed it so as not have clutter (in the lines and format of the house). 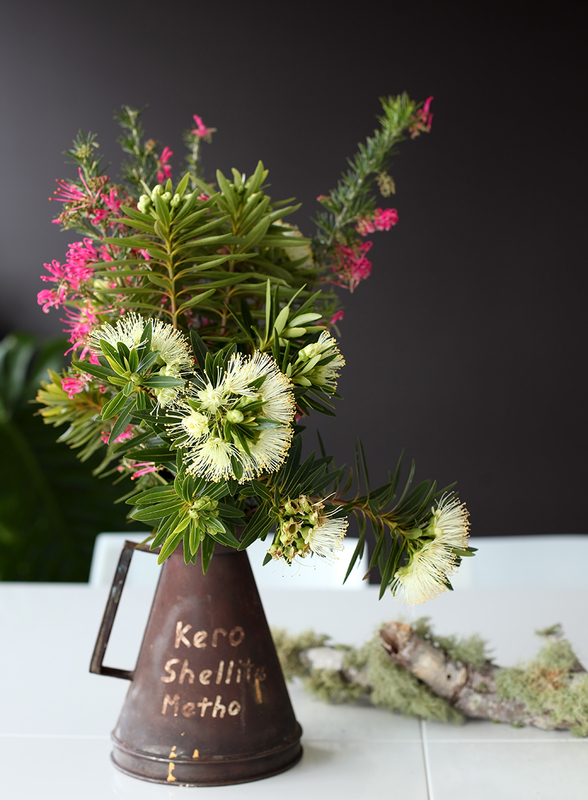 The temptation when you have a big space is to fill it up, but we’ve resisted that.” Instead, the Rogers display just a single vase of fresh flowers from the garden or a few large leaves in a glass carafe. 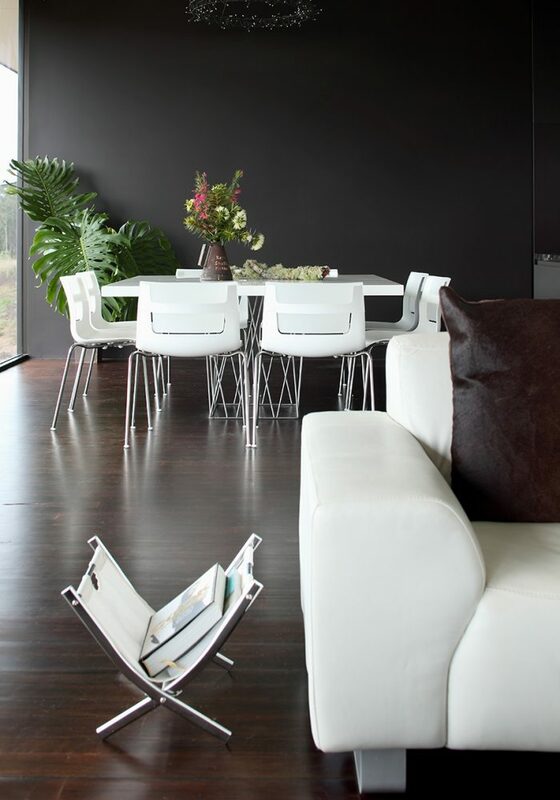 These controlled touches complement the white-leather lounge suite, glass dining table and white B&B Italia dining chairs from Space. 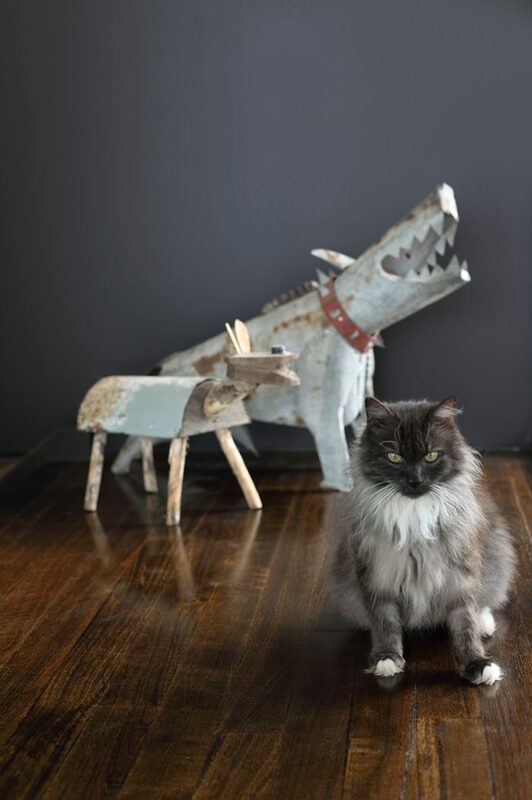 A few treasured pieces – a quirky corrugated iron sculpture of a dog made by a Tasmanian artist and a painting of a cat bought from a vet in Chatswood – are personal touches that add a sense of homeliness but do not take away from the drama of the glass and spectacular views. “Misao is Japanese so she is very good at choosing things that will look good,” Bill said. “She’s very creative.” The Rogers are proof that style is more about what you leave out rather than put in. “We didn’t have an unlimited budget so we had to keep reigning the architect in and reminding him of this,” Bill said. 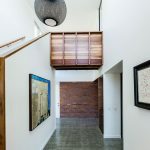 “In the end we’ve succeeded in building a high quality and stylish residence which will last for many years.” One of Bill and Misao’s favourite features is the huge deck. “We designed the deck so that when you walk up the stairs from the outside you don’t know what is there and suddenly you are on this huge deck which juts out like a springboard, with a fantastic view of the chimney shaped Mt. Coonowrin,” Bill said. “It’s a dramatic thing. We haven’t cluttered the deck with things. Just one large table and chairs to align with the mountain. 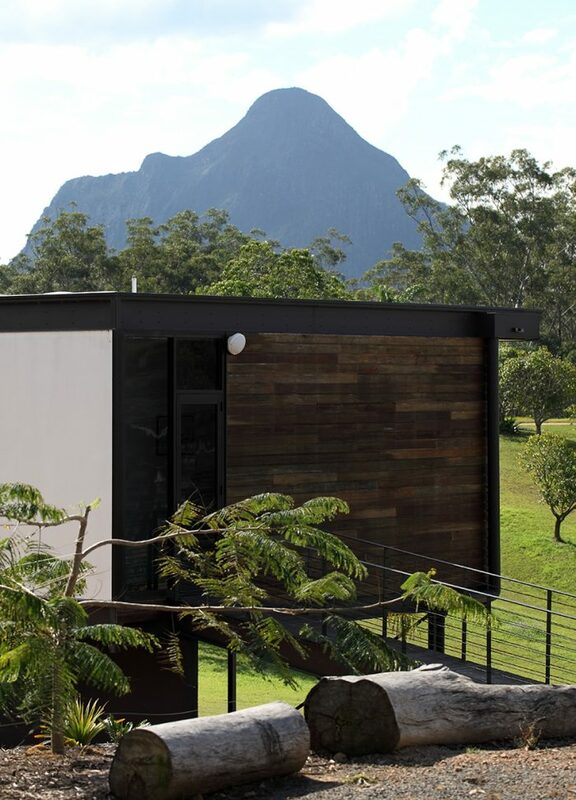 The mountain must be allowed to be the star.” Their beautiful home is an elegant stage to enjoy the spectacular Glasshouse Mountains. And live in comfort and luxury as their guests do.